Please pardon the appearance; the primary reason for this web site is to post the "Free Stuff" below. Chip's Challenge Editor At last! Create your own Chip's Challenge levels! Born in Pittsburgh, Pennsylvania in 1963; graduated Bethel Park High School (Pennsylvania) in 1981; B. S. Computer Science and Mathematics, University of Pittsburgh, 1985. Worked as a (Computer Language) Translation Engineer for Lexeme Corporation, 1985-1989; as a Software Development Consultant for Whitfield Software Services, 1989-1999. Customers included Digital Equipment Corporation, Blue Cross of Western Pennsylvania, and Microsoft Corporation. Currently employed as a Software Release Engineer for General Dynamics C4 Systems, a company which produces a unique information visualization software package used for military, business management and life sciences applications. Our local office is in the South Side, within sight of where I went to college. Involved with Stage 62 since moving to Bethel Park in 1967; Favorite roles include Tim Allgood, the hapless Stage Manager in Noises Off, the world-famous Roger Hopewell in The Musical Comedy Murders of 1940 , and the Wizard in a children's version of The Wizard of Oz. As it happens, I first met my wife Sandy Boggs when I was cast as her fiance in The Desperate Hours for The Siena Players; later we became engaged during final curtain call of The Wizard of Oz. Sandy remains heavily involved in theater, as is our daughter Adrienne. Many in Western Pennsylvania will find me in their photo albums, having placed their children at the controls of the Buhl Science Center's Miniature Railroad and Village; I volunteered as an engineer there for eight years. I also used to teach sailboating at the Pymatuning Red Cross base from time to time. I now direct the adult and youth handbell choirs at Christ United Methodist Church and still find time for bicycling on the old railroad trails and hiking in the mountains nearby. In 1965, my father, a civil engineer for Allegheny County, hiked a few miles of Pittsburgh Railways (now Port Authority Transit) private streetcar track with another engineer, taking pictures along the way. Somehow I ended up with the original pictures. 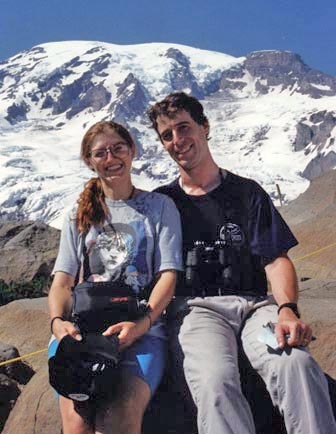 In 2005, Friedman Wagner-Dobler and I hiked to the same spots and took those very same pictures. It is amazing how much stayed the same in those 40 years. You can find those images here.